Tim McGraw as popularly known was named Samuel Timothy McGraw by birth and he is a renowned country singer, songwriter and an actor. Tim McGraw was born in the year 1961 to his parents: Elizabeth Ann D'Agostino and Frank McGraw. Tim McGraw is 51 years old now and he is an outstanding singer, as well as an actor at his best. Tim McGraw is the son of Elizabeth who lived with her husband for a short while before she was sent to a relatives place to live when she became pregnant. Tim McGraw became an only child from his mother having three (half) siblings from her father's side. As a young boy Tim McGraw having relative origins from his parents' sides; he had the Irish and Italian descent from his mother and English, Scottish, Scots-Irish, Swiss, Dutch, German, and Czech descent from his father's side. Tim McGraw had a stepfather, Horace Smith, whom he believed was his stepfather for the first eleven years of his life. His father denied the paternity for seven years until he was 18. His father later became fond of him until his death in the early 2000s. Tim McGraw as a young boy loved to play baseball and he was also a member of the FFA when he was in high school. After graduating from high school, Tim McGraw went to Northeast Louisiana University on a baseball scholarship. He was unable to continue as a sportsman after sustaining a knee injury. He later learned how to play the guitar and after a while, he dropped out of school after moving to Nashville with his mother to pursue a musical career. Tim McGraw bio will be incomplete without making a perfect track to the history of his musical career. Tim McGraw came to the light as a singer on a fortunate day in the year 1990 when his father played his song while driving with a friend who was friends with Curb records executives. The Demo single was played to the executives and they liked it, and he got his first contract with the record. Tim McGraw released his first single with the label "What room was the holiday room" and it never got much recognition. Later in the '90s, Tim McGraw released some songs which include Not a moment too soon, All I want, Everywhere and A place in the sun. In the 2000s, Tim McGraw released several albums which Greatest Hits, Set this circus down, and Tim McGraw, the dancehall doctors, Live like you were dying, Let it go, and Southern voice. In the 2010s, he released other albums which included a Love story and Sundown Heaven town and others. As an actor, he had his first appearance in the Jeff Foxworthy episodic show in 1997 and he had other appearances in different films and dramas. Tim McGraw married Faith Hill in the year 1996 and he has three children. Tim McGraw family contains three children and he is said to make an annual income of $38 million. The Tim McGraw facts lie in the fact that he is a certified airplane pilot and he also has a single engines Cirrus SR22 to himself. Tim McGraw bio will not be completed if his achievements are not mentioned. 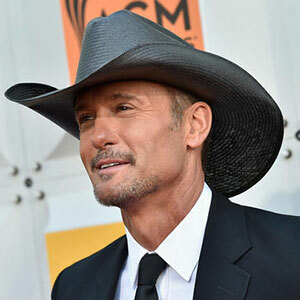 Tim McGraw facts entail the record that he won three Grammy awards, fourteen Academy of country music awards, eleven country music association awards, ten American music awards, and three People's choice awards. He is a great country singer, actor, producer, and politician. Tim McGraw is a well-known singer and he has proven to be the best.